Let’s face it – Mark Zuckerberg still has one up on the world. Did you know that Facebook has 1.32 billion daily active users? There are 400 new users signing up on the platform every minute (Including that Facebook invite from your Mom that’s been pending for the past few months). In South Africa, there’s been a Facebook metric increase in 2018, with the number of active users reaching a staggering 18 million. This is expected to rise up to 19.69 million by the end of 2019. Not bad for a social media platform that launched from somewhere in a Harvard dormitory room, right? Brands noting the glaring success of Facebook in recent years have sought after connecting with their audience on the platform – using it to market products & services and in return influencing buying decisions. 57% of consumers are reportedly swayed by social media, led by Facebook at 44%. 93% of social media advertisers use Facebook Ads and have had major returns, leads, and financial gains. These stats barely leave room for questioning the importance of having your business on Facebook in the current digital age. What remains a high priority for all marketers is getting quality traffic to their websites and more crucial than that is being able to convert this traffic into potential customers. Consumers who have shown interest in your product or service by taking an action in some way are known as “leads”. With this said, lead generation then becomes the process of attracting and converting visitors into leads. Facebook has repeatedly served as a network appropriate for the implementation of lead generation. With its attractive interaction rate, marketers and advertisers have opted to utilize it when trying to generate leads organically or through paid promotions. Through the promotion of content, discounts and offers, social followers are turned into leads by being directed to traditional lead forms on landing pages. Potential leads who aren’t already familiar with a brand are driven to a website through a variety of ad types from Facebook Ads. What forms part of these ad types is also Facebook Lead Ads. Facebook Lead Ads are ad types that allow potential customers to access your offers without having to leave Facebook. With this feature, you’re able to capture lead information from the social media platform, in return avoiding the inconvenience of a longer click-through-rate path for the user. Granted, the traditional lead generation conversion path where users are driven to a landing page to fill out a form normally generates high quality leads. This is because people who go through the effort of obtaining your content or offers are genuinely interested. However, the downside of that is the long haul of the numerous steps which ends up causing disinterest in users and resulting in missed highly qualified prospects. 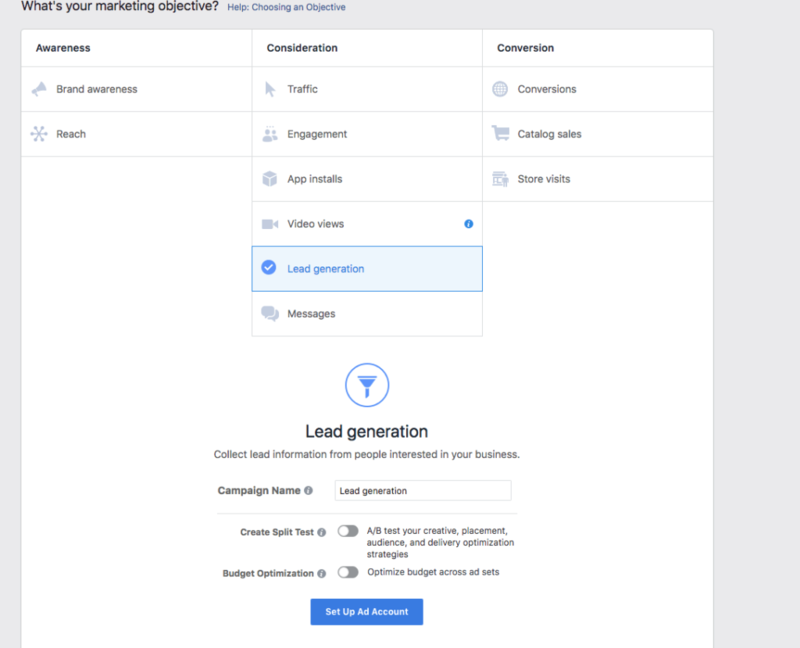 A case study conducted found that cost-per-lead can decrease by up to 80 percent after leveraging on the lead acquisition from Facebook Lead Ads campaigns. The use of forms in these ad types creates a seamless experience for the user, thus attaining better conversion rates. Additionally, Facebook Lead Ads are also beneficial for mobile users who have a disruptive user experience caused by switching between apps while moving from Facebook to your website. The advertisers capture information without having to create new paths or landing pages as well. A win for both sides. Facebook Lead Ads are just like any other typical Facebook ad types. The first step as an advertiser is to set up an ad using Facebook Ads Manager or power editor. You are then allowed the ground to customize targeting features, creative assets and your budget to ensure that the ad reaches your ideal target audience. This advertisement afterwards gets displayed to a potential customer’s user news feed as a sponsored post. Lead Ads work through the promotion of a lead generation offer so it’s crucial that a benefit or incentive is offered in order for a goal to be achieved. Now, for the exciting part. Before anything, make certain to ensure that your company’s intent falls in line with Facebook’s lead ads policies. The form fields your business plans to put out need to align with these policies. 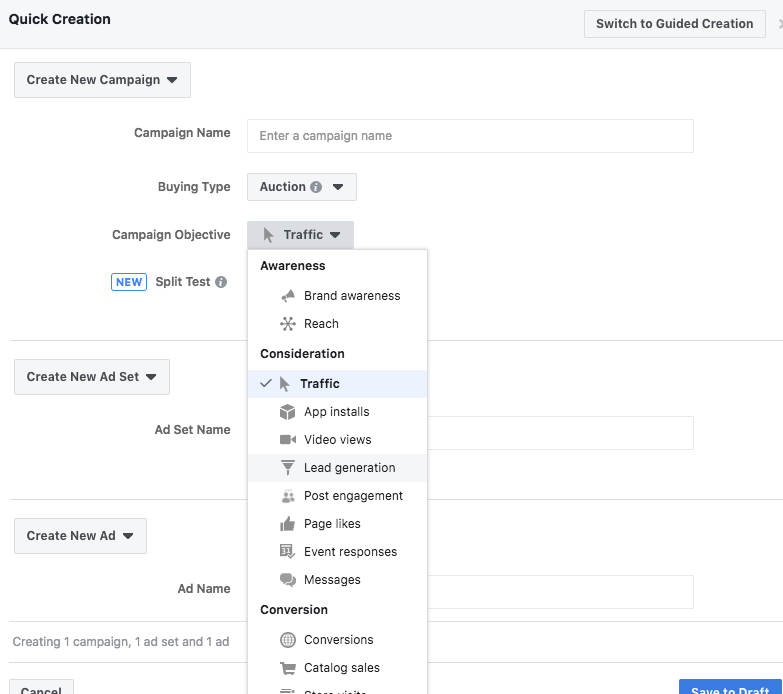 Facebook allows you to determine your marketing objective from initial set up in the campaign. Targeting lookalike audience of existing customers who have been to your site before or have interacted with other ads in the past is a guaranteed way of reaching your high-quality leads. With this approach, you’re not just taking a wild guess on what your shopper might be interested, potentially wasting your budget. Keep in mind to segment your existing customer base as well. Analyze data from people who have converted on other channels as well either organically or through remarketing and use that as guidance in what boundaries you wish to set. Find out what content or copy made them convert and what demographic data can be gathered from these consumers. With Lead Ads, the more people you target, the less powerful your ads become and the higher the cost. What need are you fulfilling? What are you giving back to your consumers? If your business is using lead acquisition as its primary marketing objective, then you’re more likely aiming to create awareness or an initial point of contact with a potential prospect. This would require your ad to be more informative. Next, when you have established one or more offers, you need to showcase your value to potential leads in order to eliminate their scepticism. For B2C businesses, coupons and discounts often work magic along with limited time offers, free demos, early access to content and weekly or monthly deals & discounts. Importantly, walk your users through the signup process and specify that they will only receive benefits once they have completed the sign-up form so to avoid confusion. Most people are primarily visual individuals who retain images better & faster than they do text. Have a short and concise value proposition that will entice the audience to complete the lead form signup. Explain in simple terms what you’re offering and reiterate why an individual needs to sign up. A sign-up form should be short and concise as possible; only asking for pertinent information such as an email address and/or a phone number. The more requests, the less the interest and conversion. This is the most important step. Use ‘Appointment Scheduling’ and clear language to communicate to your audience when they should expect a follow up email or phone call. Make use of CRM or MailChimp and incorporate these into your ad campaign so that you can collect prospect information for future purposes. Afterwards, implement remarketing and email campaigns with personalized offers that incite further engagement and conversion. A CRM will also assist in lessening manual obtaining of information from lead forms. Setting up Facebook Lead Ads is very simple and has proven to bear incredible results. They are not meant to drive sales but help in adding lead prospects under your belt. These ad types are especially beneficial for targeting mobile users on Facebook who don’t intend on purchasing a product on that platform – an approach that’s at times better than generating new sales targets. Speaking of Ads, here are 5 Great Benefits Of Using Google Ads, and Why You Should Start Today! Business Tech. 2018. How many people use Facebook, Twitter and Instagram in South Africa. [ONLINE] Available at: https://businesstech.co.za/news/internet/199318/how-many-people-use-facebook-twitter-and-instagram-in-south-africa/. [Accessed 10 October 2018]. Donnelly, G. 2018. WordStream. 75 Super-Useful Facebook Statistics for 2018. [ONLINE] Available at: https://www.wordstream.com/blog/ws/2017/11/07/facebook-statistics. [Accessed 10 October 2018]. Finn, A. WordStream. 2018. How To Create Facebook Lead Ads That Convert. [ONLINE] Available at: https://www.wordstream.com/blog/ws/2016/08/24/facebook-lead-ads. [Accessed 10 October 2018]. Hubspot. 2018. Facebook Ads Guide | How to Use Facebook Lead Ads. [ONLINE] Available at: https://www.hubspot.com/facebook-marketing/facebook-lead-ads. [Accessed 10 October 2018]. Jones, K. Search Engine Journal. 2018. 6 Effective Tips for Writing Facebook Lead Ads That Convert. [ONLINE] Available at: https://www.searchenginejournal.com/how-to-write-facebook-lead-ads-that-convert/270945/?utm_source=email&utm_medium=daily-newsletter&utm_campaign=daily-newsletter . [Accessed 10 October 2018]. Statista. 2018. South Africa: number of Facebook users 2022 | Statistic. [ONLINE] Available at: https://www.statista.com/statistics/558248/number-of-facebook-users-in-south-africa/. [Accessed 10 October 2018].